The Link River Dam is a concrete gravity dam on the Link River in the city of Klamath Falls, Oregon. It was built in 1921 by the California Oregon Power Company (COPCO), the predecessor of PacifiCorp, which continues to operate the dam. The dam is owned by the U.S. Bureau of Reclamation. Link River Dam's reservoir, Klamath Lake, has a capacity of 873,000 acre feet (1.077×109 m3). The project provides flood control, generates hydro power, and stores most of the water used for irrigation in the Klamath Reclamation Project. The dam is 22 feet (7 m) high and 435 feet (133 m) long. Its two channels can allow one outflow of 3,000 ft³/s (85 m³/s) with 1,000 ft³/s (28 m³/s) through the Ankeny Canal, and another outflow of 290 ft³/s (8 m³/s) through the Keno Canal. Those channels feed PacifiCorp's two hydroelectric turbines located downstream and generate 151 MW. All the flow is ultimately diverted down the Link River into Lake Ewauna. In 1878, five years after the Modoc Wars, residents of Linkville formed the "Linkville Water Ditch Company." They dug a low capacity canal that connected their homes with the Link River. A William Steele extended the ditch by 15 miles in 1884. After his death in 1888 the Klamath Falls Irrigation Company took over the canal. It is now known as the Ankeny Canal. Charles and Rufus Moore dug a canal on the other side of the Link River in 1877 to power a sawmill and transport logs from Upper Klamath Lake. This later became known as the Keno Canal. On February 24, 1917, officials from the USBR and COPCO reached an agreement to lease the Keno Canal for ten years at a rate of $1,000 per annum. The agreement also allowed the power company to regulate the outflows of Klamath Lake. In 1919, COPCO placed a temporary low-crib dam near what is now Putnam's Point in 1919. Construction began on the dam on July 29, 1920. Senator George E. Chamberlain of Oregon telegraphed Secretary of the Interior John B. Payne on August 20, 1920, requesting he halt dam construction long enough to determine the legality of the 1917 contract. Payne issued a supplemental contract on December 10, and California-Oregon Power restarted construction on May 15, 1921, finishing it on October 29. As of 2014 the company intends to continue to generate electricity at Link River, in the short term and at reduced output. PacifiCorp implemented changes of operation are intended to reduce the destruction of two endangered species, the Lost River sucker and Shortnose sucker, by some 90%. Further decomissioning discussion remain pending with the governing agency, the Federal Energy Regulatory Commission. ^ Not owned by PacifiCorp, as widely reported. See "Link River Diversion Dam". U.S. Bureau of Reclamation. Retrieved 12 April 2016. and "Klamath Hydroelectric Project Overview". PacifiCorp. Retrieved 12 April 2016. ^ "U.S. Fish and Wildlife Service Issues ESA Permit to PacifiCorp for Lost River and Shortnose Suckers". U.S. Fish and Wildlife Service. 20 February 2014. Retrieved 12 April 2016. 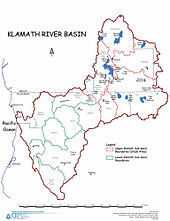 ^ "Klamath Hydroelectric Project Description". U.S. Bureau of Reclamation. Archived from the original on 8 August 2011. Retrieved 12 April 2016. Wikimedia Commons has media related to Link River Dam. This page was last edited on 22 June 2018, at 05:45 (UTC).